Construction has commenced on Genex Power’s Kidston Solar Project based around the former Kidston mine, some 270 kilometres north-west of Townsville in far north Queensland. ARENA CEO Ivor Frischknecht, who was joined at the groundbreaking ceremony by Queensland’s Energy Minister Mark Bailey, project proponent Genex and project financiers (the CEFC and Société Générale), said the project was well placed to deliver on ARENA’s efforts to accelerate Australia’s shift to renewable energy. “The Kidston Solar Project is one of 12 new solar farms to be built through ARENA’s large-scale solar round which is well on the way to changing the face of big solar in Australia,” Mr Frischknecht said. In addition to this 50MW solar project, Genex will construct a 250 MW pumped storage hydro project and an additional solar project with a generation capacity of 270MW that will be used to pump water into the upper reservoir for the hydro project. Genex Power’s Managing Director of Genex Power Michael Addison thanked all parties involved in the project financing, adding that the Kidston Solar Farm will have the highest capacity factor of all solar projects in Australia. 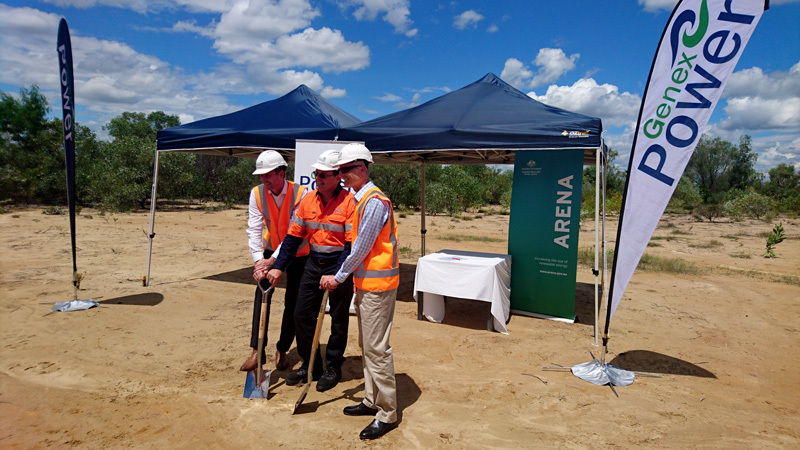 “In addition to ARENA and the CEFC, the strong support Genex has received from the Queensland State Government in the approvals process and the Solar 150 program has underpinned the successful development of the project,” he added. Energy Minister Mark Bailey thanked the project’s proponent Genex for its trust in Queensland. “This is an exciting day for Queensland, and in particular North Queensland. The Kidston Solar Project is a $126 million dollar revival of a gold mine for the North’s economy and is symbolic of the transition occurring in the energy market,” Mr Bailey said. The Kidston Solar Farm is expected to be grid-connected by early 2018.